Outdoor kitchens are becoming a common scenario in contemporary homes because of various reasons. It helps you to expand the living space, as well as allows you to cook and eat by being amidst the nature. Even your guests will get a chance to admire your patio or backyard while sitting and munching on snacks in your kitchen. The best part about an outdoor kitchen is that you don’t need to burn a hole in your pocket to get one. Another good point about it is that an outdoor kitchen can be set up in a very small area as well. 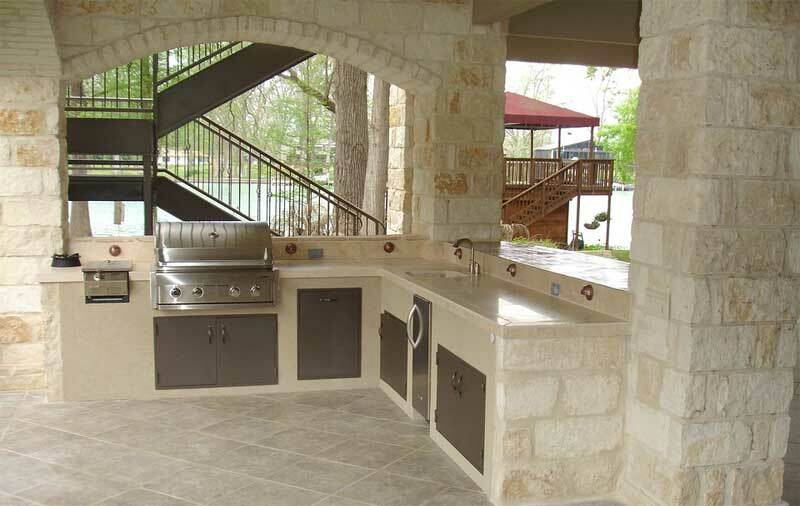 So, even if you don’t have an outstretched area of land, you can easily install an outdoor kitchen. You need good furniture for your outdoor kitchen so that you and your family or guests can relax and eat. Get some wrought iron chairs and a table to start with. If you have a spacious backyard, you can even think of a bar counter and install a few stools in front of it so that guests can easily communicate and chat with the person behind the bar. Sofas and couches will make the ambience perfect. If you don’t want to spend on a sofa set now, you can buy a few bean bags and place them on a small table. Now that you have decided on installing an outdoor kitchen, where will you keep the utensils and perishable food items (which you cannot keep in a refrigerator)? Well, ask a reputed company to install a beautiful brown or white kitchen cabinet which will not only be a storage space but also will make your outdoor kitchen look appealing. The texture and colours available today by the topmost cabinets manufacturing companies are huge. Choose one that will go with the look and feel of your outdoor kitchen. Make sure that the kitchen cabinets are not installed in a way so that space looks smaller than actual. Also, check on the number of doors it comes with, according to your need. If space is small, the installer has other checkpoints to tick as well, like for example checking if the doors or drawers of the RTA cabinets are colliding with each other when opened. If you are a serious cook, you must buy a natural gas grill which comes with wheels. So that you can port it anywhere and at any time, whenever your mood strikes and there is no obstruction when it comes to cooking. These grills are not only useful but also look great. The stainless steel effect is very much classy. But make sure that you cover it when it’s not in use, especially during winter. Apart from a portable griller, you also need a microwave and other such kitchen equipment, in order to deck up your kitchen as well as make it a perfect place for cooking delicious meals. Optimise your outdoor kitchen layout by keeping the utensils inside the cabinets. Well, we all know how perfect lighting can change a particular space. Install under and within cabinet lighting so that the entire fancy cutlery that you own comes into notice. Ceiling fans with lighting underneath work wonders for an outdoor kitchen. Also, don’t forget to get some dimmers for your kitchen. Dimmers are great for setting up the mood for evening parties or get-togethers. Other quirky ideas like turning the sink into a beverage cooler with a beautiful teak top can make your kitchen look stylish. You can also get wine racks in order to keep all the liquor stock in the display. So, invest in good RTA cabinets, beautiful cabinet lighting, and kitchen equipment and start decking up your outdoor kitchen.